There were a few speculations that Vijay might not sing in his upcoming commercial fantasy entertainer, Puli since the Kaththi actor would be flying abroad soon for a vacation, after wrapping up his dubbing duties. But the latest we hear from our sources close to the team is that Vijay has indeed rendered his voice for one of the songs yesterday, June 3. Vairamuthu has written the lyrics for this DSP track. 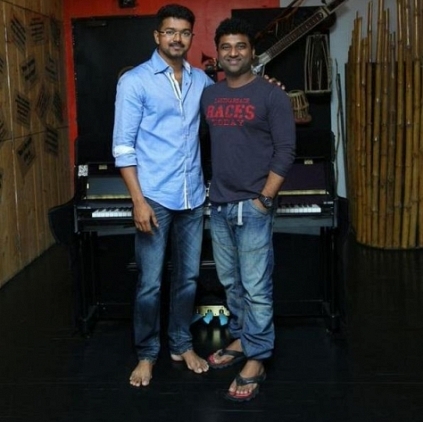 Promotional photographs of Vijay from his singing session have been released just now. The number that Vijay sang is a duet; the female singer for which has not been decided yet. We also hear that this is the song which the team shot recently in Krabi some days back, with Vijay and Shruti Haasan. Ghost over a phone call ? People looking for online information on Ilayathalapathy, Puli, Shruti Haasan, Vijay, Vijay 58 will find this news story useful.